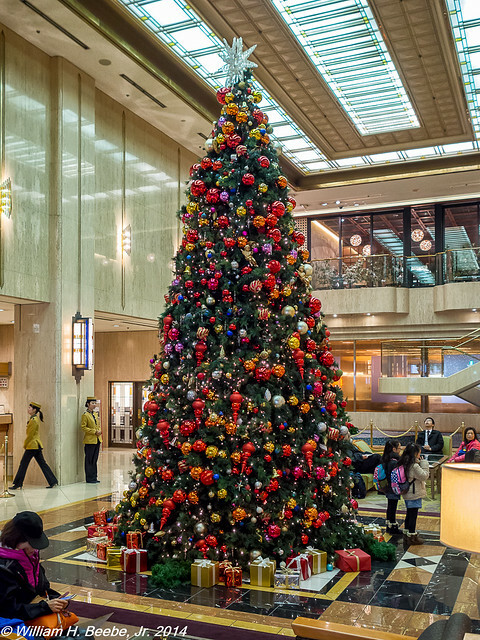 This is the Christmas tree in the center of The Hotel Metropolitan in Ikebukuro, Tokyo, Japan. It stretches a good two stories above the lobby floor. It’s covered in an immense number of glass decorations and lights. At any given moment, from the early morning until late in the evening, someone was having their photo taken in front of the tree. It was that popular. I had to wait a few moments for this relatively free view. Shinto and Buddhism are the two primary Japanese religions. This is not to say that there are no Christian adherents in Japan. Japan was first exposed to Christianity, through Roman Catholicism, in the latter half of the sixteenth century. Unfortunately for the Franciscans who were performing missionary work in western Japan at the time, they wound up being banned and persecuted, starting in the turn of the seventeenth century. Christians would remain persecuted until 1873, when Protestants would begin missionary work anew. The celebration of Christmas itself didn’t become popular with the general non-Christian population like it is today until after World War II. Today the Japanese seem to celebrate Christmas with the same fervor we do in the U.S. There are decorations and lights everywhere, and Christmas music (carols and more secular songs) is constantly playing in the background, in English. Yet, there are some things missing from Christmas in Japan. Yet there are no creches, no manger scenes. Nothing that overtly calls out to the Christian elements of Christmas. The celebration seems far more secular at least to a westerner such as myself. This is not a criticism of the Japanese. I see way too much secularism in our Christmas celebrations. Way to much emphasis on Black Friday’s and Cyber Mondays. Being a photographer and a traveler I get constantly bombarded with emails advertising all sorts of special holiday sales on camera and electronics gear and travel destinations. I can easily ignore all that because I’m already too broke to buy anything else after about mid-November, and I’ve had about all the travel I can handle by the time I come home from Japan. I’m all tapped out. And yet the exhortation to “Buy! Buy! Buy!” keeps coming at me from all sides. I manage to tune all that out because I’m broke – and too numb to pay attention anymore. This Christmas eve is the quiet before the hectic Christmas day. Tomorrow I’m going to spend time with both grown daughters, one for lunch and the other for dinner. We’re going to be even more busy on Christmas day than we were when the girls were little and living at home. To me that’s the real gift this time of year, being with our girls and their respective boy friends, sharing what everyone is doing with their lives. I guess I managed not to make too may mistakes as a dad; they still want to see me and spend time with me. Time with my girls is the most precious gift of all, especially at Christmas. 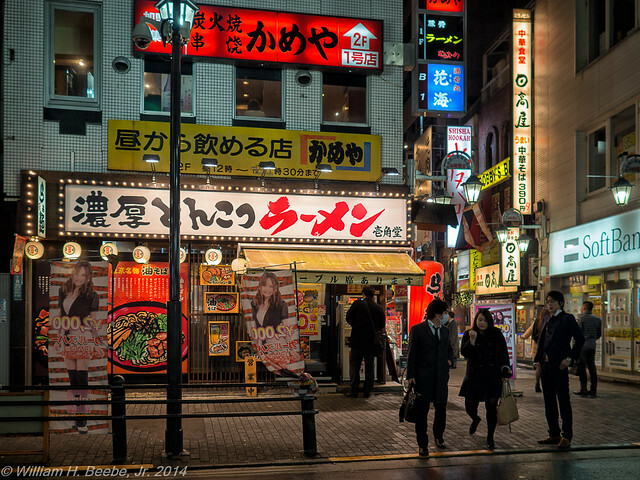 As I mentioned in the last post Andy and I spent about an hour after dinner just walking about, photographing Ikebukuro after sunset. Because of Tokyo’s location with regards to its time zone, the sun sets very early in the winter, a little after 4pm local time. 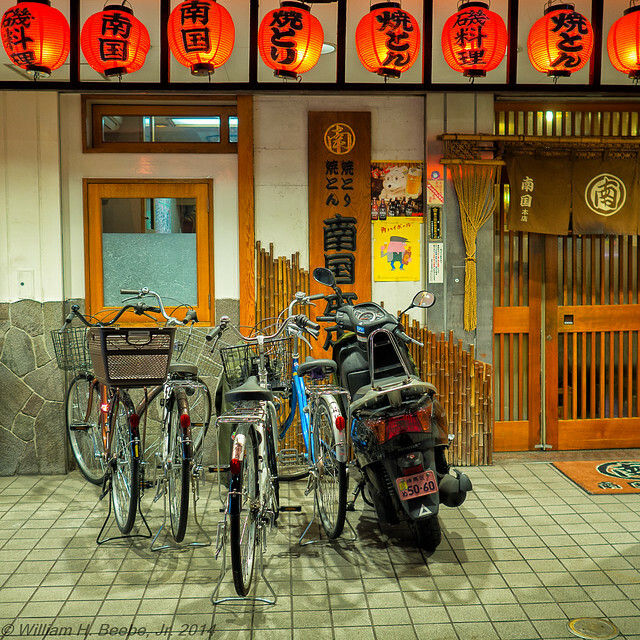 We met around 6pm, ate dinner around 7pm, and started to photograph the area around 8pm. It was officially Dark when we started. And the place was lit up like the proverbial castle. 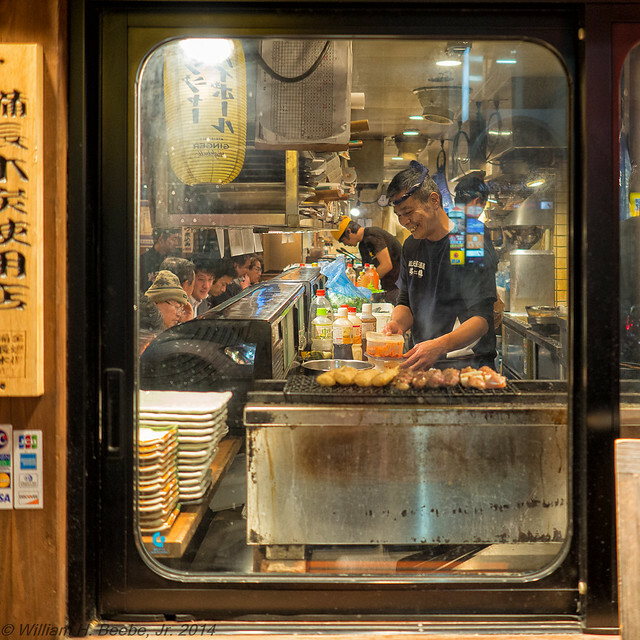 The Seiryu restaurant we ate at has an “open” window into the kitchen, right by the entrance. Here you can see one of the cooks as well as a few of the patrons at the bar that runs in front of the cooking area. This is a common enough design motif in Japan, seen at every raman shop I’ve eaten at so far in Japan (and I’ve eaten at about a half dozen so far). While there are a lot of cars, vans, and trucks in Japan, there seem to be as many bikes (both pedal and motorized) if not more. The pedal bikes in particular are complex and well taken care of. They’ll have extra seats in the back to carry children, or they’ll have baskets on the front or back (or both) for carrying items such as groceries. Their complexity and quality level leads me to believe that pedal bikes in Japan aren’t cheap or cheaply made. It wouldn’t surprise me to see the cost of bikes hovering around US $1,000. That’s not that outrageous, considering I spent US $700 on a Canondale C400 back around 2000. Sidewalks in Japan are much wider than in the states and it’s expected that bike (pedal) riders will make use of them. That means you need to be away and move out of the way when they come towards you. Anything motorized is on the main street. Even at 8pm the streets were filled with people. 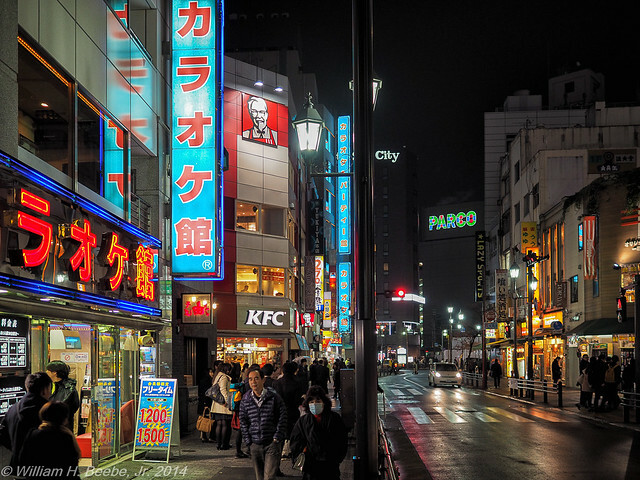 Ikebukuro reminds me of New York (from the early 1980s) where everything is lit to daylight levels and businesses are in full gear. While I have no idea what everyone was doing, they seemed to have a perfectly good idea what they were about. 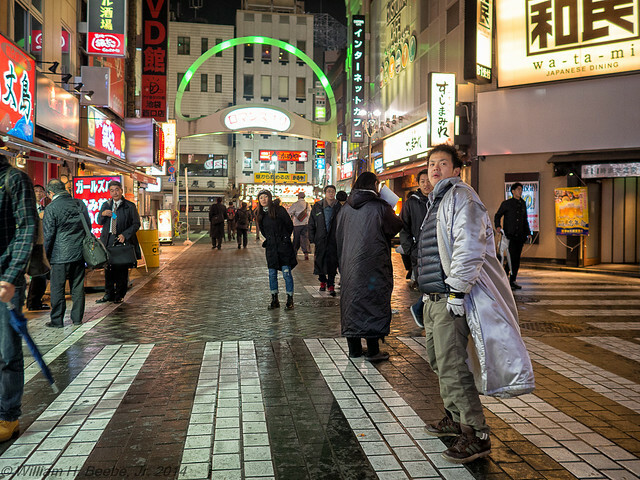 Ikebukuro is a place of color as well as motion and sound. Everywhere you looked was a riot of color. 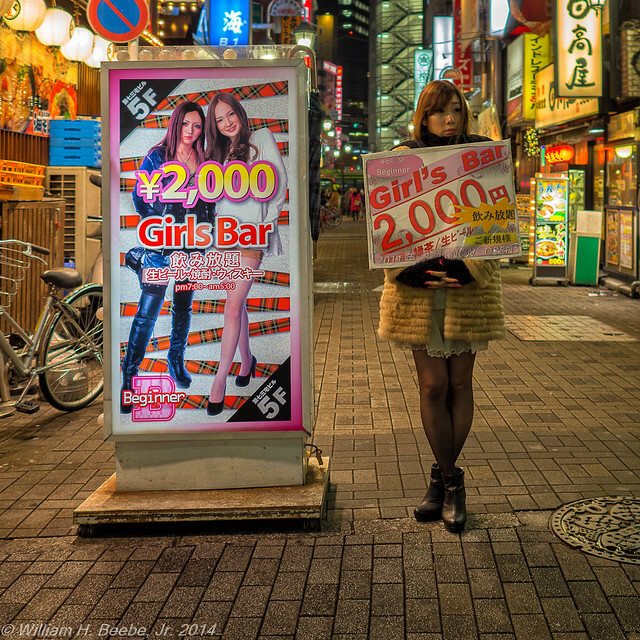 Of cautious interest were the “Girl’s Bar” advertisements. I have no idea what was involved and carefully avoided finding out. I try not to be a prude, especially in other countries, but there’s no reason to go looking for trouble. I wish I could have spent more time working at night. 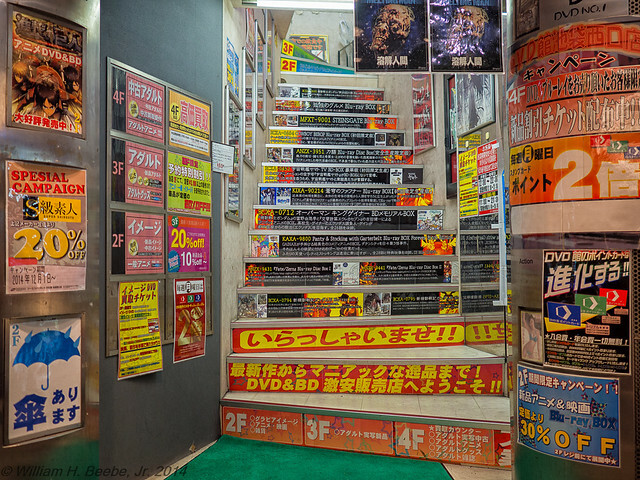 The Olympus E-M10 and the M.Zuiko 1.8/17mm handled themselves superbly in this situation. Of course, I believe that any competent camera would have worked a treat, especially in this very bright venue. Even the color seemed to come out correctly for most of these shots. The limitations of the current sensor’s exposure range seemed to come out a bit while shooting, such as the photo four photos up. You can see where the very bright areas are showing blown highlights. But you know what? I don’t care. Everything else in that photo I cared about came out just fine. I’m a photographer because I enjoy it. If I ever get to the point where I obsess over such minor issues then I won’t be enjoying it, and it’ll be time for me to hang up the cameras and retire to one of God’s waiting rooms until I finally die. Also known as a Florida retirement community.